Several rich legends are associated with Chidambaram. The best known, are those describing the Cosmic Dance of Shiva, the dance duel between Shiva and Kaali and the more recent one describing the re-discovery of the Tevaram hymns. The Cosmic Dance of Shiva: Legend has it that Aadi Seshan, the serpent (couch) of Vishnu, heard Vishnu's exhilarating description of Shiva's Dance of Bliss. Filled with irrepressable desire to witness this dance in person at Chidambaram, Seshan descended to the earth as Patanjali (the one who descended). 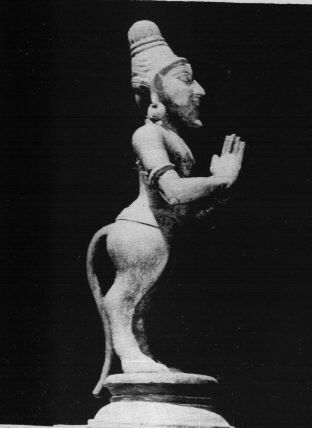 Vyagrapaadar, another devotee of Shiva prayed to obtain the tiger's claws so that he could obtain with ease the sacred Vilva leaves meant for Shiva's worship at Chidambaram. The two sages spent their time in prayer and meditation - in anticipation of Shiva's Ananda Tandavam. Chidambaram is also known as Perumpatrappuliyur. Five shrines in which Vyagrapaada (pulippaadar) is believed to have worshipped Shiva, are revered by the tamil hymns of the Nayanmar Saints. 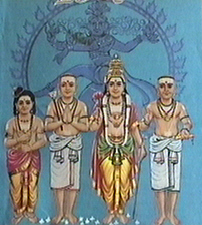 They are Omampuliyur, Perumpuliyur, Erukkattampuliyur, Paatirippuliyur and Perumpatrappuliyur (Chidambaram). Patanjali and Vyagrapaadar are also believed to have worshipped Shiva at Vilamar and Tiruppunkur. There is also a shrine to Patanjali Naathar (Shiva) at Kaanaattumullur. Legend also has it that the dance of bliss of Shiva, was enacted upon Shiva's (Bhikshatana) victory over the married ascetics of Dhaaruka Vanam upon quelling their vanity. 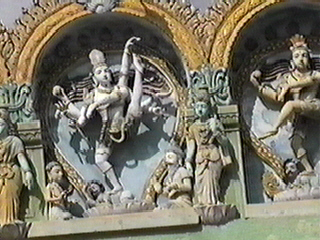 The Dance Duel between Shiva and Kaali: Yet another legend, commemorating the dance duel between the doyens of dance Shiva and Kaali is associated with Chidambaram. Towards the end of a fierce competition between Shiva and Kaali, in a move to determine who the superior dancer was, Shiva is said to have lifted his left foot towards the sky in the Urdhuva Tandava posture, a definite male gesture, which out of adherence to protocol, Kaali could not reciprocate, thereby causing Shiva to emerge victorious, delegating Kaali to the status of a primary deity in another temple in the outskirts of Chidambaram. This legend is portrayed in the Nritta Sabha, one of the halls within the Chidambaram temple. The same legend holds in the Tiruvaalangaadu Nataraja temple near Chennai. The Re-discovery of the Tevaram hymns: There is another recent legend associated with this temple. The sacred Tamil works of the Nayanmaars (composed in the 2nd half of the first millennium CE) had been missing for several years, and it was during the period of Raja Raja Chola (the builder of the Grand temple at Tanjavur) that formal research was initiated to trace these fine works of devotional literature. These works of the Saivite Saints - rich in musical content were recovered in a dilapidated state in one of the chambers in this vast temple, after the monarch brought images of the Saint trinity in procession to the temple.